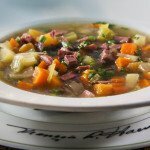 Here is a recipe that uses duck or goose carcasses and legs, which are too often discarded, to prepare a delicious soup. TO PREPARE THE STOCK: Remove duck or goose breasts and reserve for other recipes. Wash duck parts well and place in a large stock pot. Add cold water to cover and bring to a boil. Skim all froth from the surface. Lower heat and add other stock ingredients. Simmer uncovered for 2 - 3 hours until the duck legs are tender. Add water as needed to cover ingredients and skim as necessary. Strain the stock into a large bowl through a colander and reserve. Allow bones to cool and pick duck meat from the carcass and legs. Dice the duck meat and reserve. TO PREPARE THE SOUP: Melt butter in a heavy 4- or 5- quart saucepan or Dutch oven. Add the onions, carrots, celery, and leeks, cover and cook slowly over low heat for 15 minutes, stirring occasionally. Do not brown the vegetables. Pour in the duck stock and gently boil until all the vegetables are partially tender, about 15 minutes. Add the string beans, potatoes, tomatoes, turnips salt and pepper. Simmer for 20 minutes, or until the potatoes are tender. Add reserved duck meat and bring soup to a boil. Chop the garlic and uncooked bacon together to form a paste. Remove the soup from the heat and stir in the bacon-garlic paste. Add the Tobasco, adjust seasonings and serve. 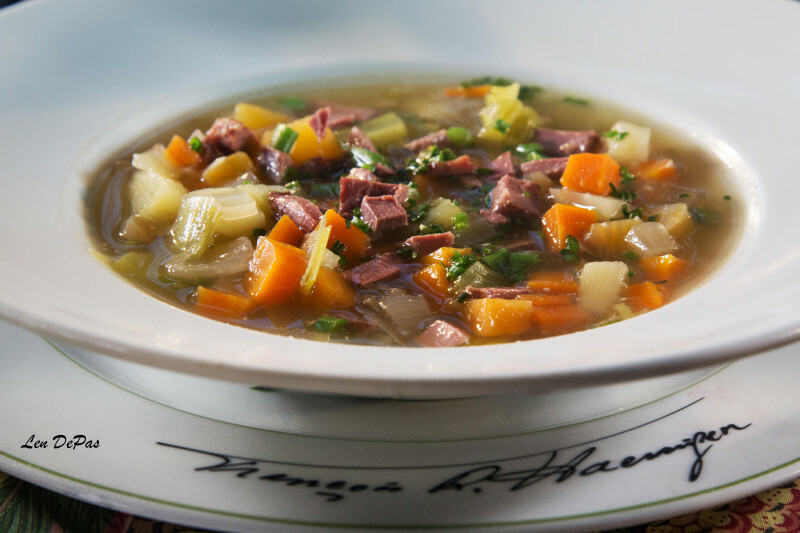 HINT: Add a few drops of Worcestershire sauce, fresh chopped parsley or chives to each portion of soup just before serving.